Big low-end power in a portable combo. After months of research & development, Ashdown has designed a range of products that are equipped with more features, more power, new stylish designs and best of all, a dramatic reduction in size and weight. 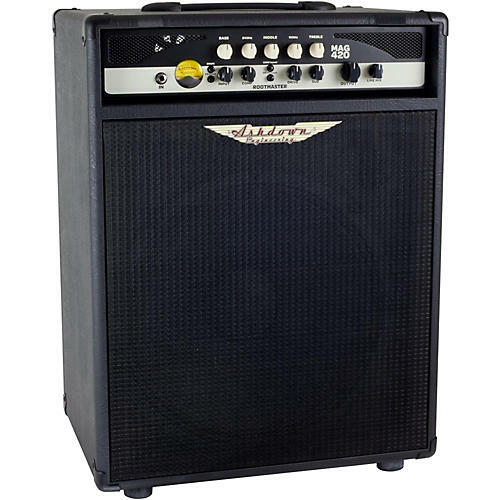 The Rootmaster range of bass amplifiers truly stands out from the crowd. The RM-420 combo features a comprehensive Pre Amp, with a classic 5 band EQ, an all-new compressor, plus footswitchable Drive and Sub Harmonic effects. A newly designed Class D power section and specially designed Ashdown 1 x 15" speaker help keeps the weight down. Other features include a mini jack auxiliary input with level control, FX loop, XLR DI, Speakon/Jack combination out and a jack input for an (optional) FS-2 footswitch. The all new MAG RM range is the solution for bassists who need affordable and dependable light weight power houses that present real low-end power. If you want to use your favourite pedals or multi-effects, you'll find send and return sockets on the back panel, along with a DI output for direct injection into the PA mixer or recording console and a Line Input (with front panel level control) so you can jam along with a backing track in rehearsal. Dual outputs: 23.7" x 18.4" x 13.1"